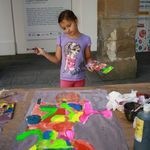 Young visitors between the ages of 4-11 can spend Tuesdays all summer long exploring art, playing games and being creative. In August we are organising a 3-day workshop for children, teenagers and adults. Children will have a chance to develop basic art vocabulary in English. Summer will conclude with puppetry workshops and puppet show during Maribor puppetry festival – Lutkovni pristan. Young visitors between the age of 4-11 can spend Tuesdays all summer long exploring art, playing games and being creative. Natalija Šeruga is one of the artists exhibited in the UGM collection exhibition 60! PANORAMA. The artist will present her work, followed by a workshop in painting techniques. Price: 25 € / 17,50 € (UGM Club Members) / cost of material included in the price. Book until 15 August 2014 at UGM ticket desk (Tue-Sun 10:00-18:00)! Children will have a chance to develop basic art vocabulary in English. For children aged 7 to 14. Price: 8 € / 5,60 € (UGM Club Members) / cost of material included in the price. Book until 15 August 2014 at UGM ticket desk (Tue-Sun 10:00-18:00)! 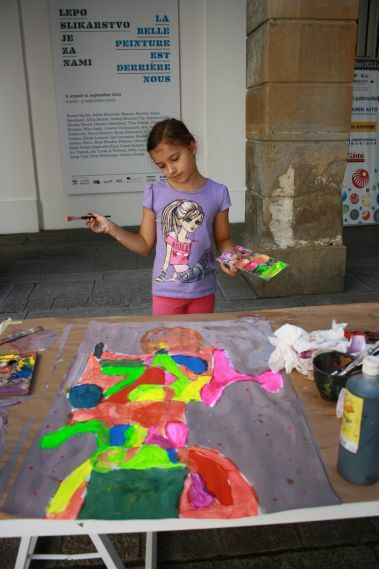 Summer will conclude with an exhibition of works created by children during summer workshops and a puppet show during Maribor puppetry festival – Lutkovni pristan. Young visitors between the ages of 4-11 are invited to spend the evening exploring art, playing games and being creative during Maribor puppetry festival – Lutkovni pristan.